Downtown construction can be noisy, messy and disruptive. We are working to minimize inconvenience. Meetings with neighborhood residents and downtown businesses are being planned to provide information and respond to concerns. The Town of Chapel Hill is implementing public improvements that will make Rosemary Street safer and more pleasant for pedestrians. On Rosemary Street between Henderson Street and Merritt Mill Road, the project is finalizing the widening of sidewalks; improving sidewalk ramps so they meet ADA standards; installing new pedestrian-level light fixtures with LED lights; replacing curb and gutter sections and driveway ramps; and repaving the street. Improvements include a brick amenity strip with street trees, bike racks, and trash and recycling containers. Funded with $1.6 million in street and sidewalk voter-approved bonds, the improvements are outlined in the Downtown Streetscape Master Plan. The Town has been working to acquire right-of-way or public use easements to connect sidewalks on Rosemary Street. Construction is expected to continue through the end of 2016. The latest news on this project will be provided in this space. 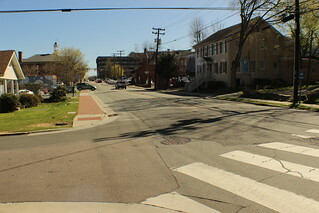 Streetscape is designed to enhance the pedestrian experience with sidewalks, crosswalks, lighting, benches, public art and plantings, along with other improvements in the public rights-of-way along Franklin and Rosemary Streets, including cross streets from Merritt Mill Road to Henderson Street. Almost all Streetscape improvements have been funded with bonds approved in 1996 and 2003. In November 2015, Chapel Hill voters approved $16.2 million in bond funds for street and sidewalk improvements. These funds will be used to construct bike lanes, off-road paths and bicycle tracks consistent with the top priorities of the Chapel Hill Bike Plan – and to repair, connect and construct new sidewalks to improve pedestrian connectivity and safety. The Town of Chapel Hill will report on its progress toward these goals in its online Capital Program Report at http://bit.ly/1MbxVAX . The curb has been raised to meet the level of the asphalt in the street. Other grade changes were necessary so that the sidewalk is as level as possible for improved accessibility. The necessary grade adjustments could not be accomplished in a way that would not impact tree roots. Underground conduit has been installed so that wires for new pedestrian lighting is underground instead of overhead. The plan is to replace the eight street trees removed in June with 10 new trees in tree grates over tree pits filled with structural soil to minimize disruption of sidewalks with tree roots. Trees will be planted later this fall, after Halloween.